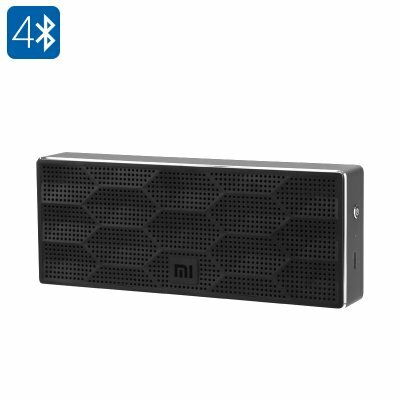 Successfully Added Xiaomi Mi Bluetooth Speaker - 1200mAh, 10 Meter Bluetooth Range, Bluetooth 4.0, 2x 2.5W, 80dB (Black) to your Shopping Cart. With this beautiful Bluetooth speaker from Xiaomi, you’ll be able to listen to all your favorite songs in style. Not only is this wireless speaker a perfect asset to any modern household, it also features an extremely portable design – allowing you to carry it along and enjoy your music wherever you go. Crafted out of durable ABS material and featuring an aluminum alloy cover, it arguably is one of the toughest and most stylish outdoor Bluetooth speakers available on the market. Thanks to its ultra-fast Bluetooth 4.0 support, it can be effortlessly paired with your smartphone, tablet, or laptop – allowing you and everybody around you to listen to some fine tunes in great audio quality. Packing an epic 1200mAh battery, the Xiaomi Bluetooth Speaker delivers up to 12 hours of usage time thanks to which it allows you to head out without needing to worry about battery life. When running low on juice, it can be easily recharged through its micro-USB port. Supporting a 10m Bluetooth range, this Bluetooth portable speaker brings along great mobility. From now on you’ll be able to move around with your phone or laptop without disturbing the audio signal to your wireless speaker. Its built-in 2x 2.5W speakers produce audiophile great music quality and by reaching up to 80dB, you can be assured that anybody around you will be able to enjoy those all time classics to their absolute most. Whether you use it at home, in the park, or at the beach – this portable Bluetooth speaker brings along great efficiency and lets you enjoy your favorite songs wherever you are. Simply sync it with your Bluetooth enabled device, select your favorite song, and enjoy. Thanks to its portable yet stylish design, this wireless speaker can be used both at home and outdoors – making it the perfect electronic gadget to all music lovers out there. This Bluetooth portable speaker comes with a 12 months warranty, brought to you by the leader in electronic devices as well as wholesale electronic gadgets..